It’s a full moon today. When the sun sets, the glow of the moon will illuminate our paths and say goodnight to us through our windows. Its light is not its own of course, but that of the sun, reminding us that we are capable of reflecting light from others in times of darkness. Fortunately, the darkness is receding and May’s full moon will rise and set at the time many rhododendron flowers are at their peak. They too glow through my window with an abundant pale pink luminescence that brings me joy year after year. 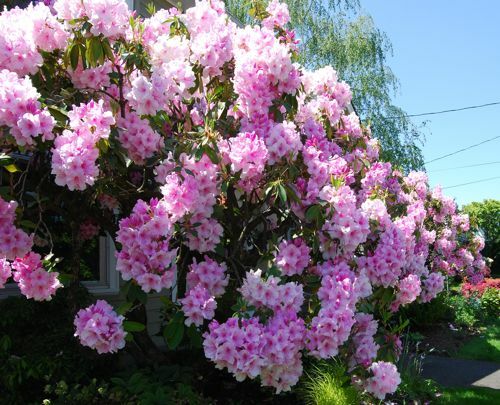 We have two very large rhododendrons in front of our house, so large in fact that they are its defining feature. They are no longer shrubs at this point, we call them trees. Squirrels and chickadees frolic in their branches, while bumblebees collect pollen from their full blossoms. 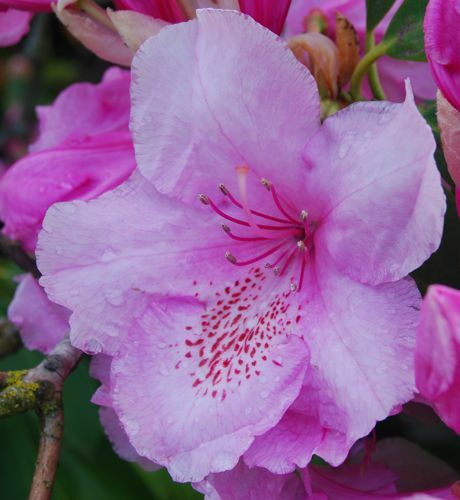 I’m sure they appreciate our rhododenrons’ voluptuousness as much as we do. I’d like to thank Roxana Villa of Roxana Illuminated Perfume for asking me to be a part of the May Flowers event. Writing this piece makes me appreciate our beautiful rhodies even more. Please visit Roxana’s Blog for more May Flowers! Previous Post Malie Organics. Beauty from Kauai. I love how you brought in the Full Flower Moon and related it to reflecting light. Thank you for reminding us of our power to illuminate. Beautiful photos! Thanks Roxana, and thank you for having this May Flowers event! Stunning flowers! What do they smell like? Gorgeous! Such voluptuous blossoms, and a very nice sentiment. I hadn’t either. When Roxana offered to send me some of the rhodie leaf EO I was very intrigued. I’m not sure if it’s used very often in perfumery, but it seems like it would make an interesting substitute for lavender. My neighbor was telling me about a white, fragrant rhodie, some type of hybrid? I have had no luck finding such a thing in person but he said it could be sniffed at a rhododendron species garden outside of Seattle. Your rhodies are beautiful, huge, and such a delicate color. They have to bring you so much joy this time of year!